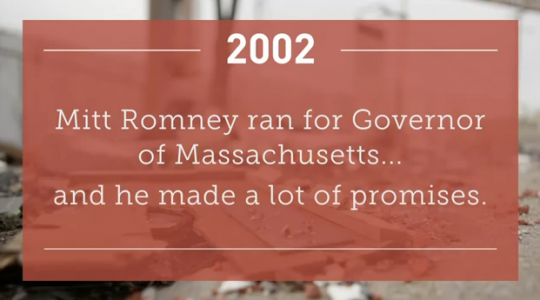 The Massachusetts Democrats featured in "Broken Promises," the Obama campaign’s latest attack on Mitt Romney, criticize Romney for failing to bring down taxes—despite the fact that they helped defeat a proposed Romney tax cut in April 2005. The Democratic politicians, whose party affiliation is not identified in the video, also represent areas that received millions of dollars from Obama’s stimulus package, raising concerns that the ad is political payback. Carl Sciortino, the state representative for the 34th Middlesex district, says in the ad, "The only place that I remember Mitt Romney actually cutting taxes was for the 278 wealthiest families in our state." However, Sciortino was serving in the Massachusetts state legislature at the time Massachusetts Democrats banded together to block Romney’s tax proposal, which would have reduced the state income tax rate across the board. For nearly a year, Romney has been urging the Legislature to reduce the state income tax to 5 percent. In 2000, voters approved a gradual lowering of the income tax rate, which was 5.85 percent at the time, to 5 percent. But in the depths of the state's fiscal crisis in 2002, the Legislature froze the rate at 5.3 percent. Massachusetts Democrats also handicapped further Republican attempts at cutting taxes by attaching an amendment requiring a study on the impact of the tax cut, indefinitely delaying the proposed decrease to 5 percent. The three Democratic mayors featured in "Broken Promises"—John Barrett, former mayor of North Adams, Jack Yunits, former mayor of Brockton, and Rob Dolan, current mayor of Melrose—represented municipalities that benefitted heavily from Obama’s 2009 stimulus spending. According to Recovery.gov, North Adams was awarded more than $18 million in stimulus money. Brockton received almost $82 million. Melrose received around $3 million. The four state representatives featured in the ad also represent areas that received piles of stimulus cash. Jay Kaufman’s district received over $182 million, Karen Spilka’s district received almost $100 million, Jeffrey Sanchez’s district received over $30 million, and Carl Sciortino’s district received over $35 million, according to Recovery.org. The appearance of these politicians suggests the ad might be political quid pro quo for the Obama administration funneling millions of stimulus dollars into their districts, skeptics say. This entry was posted in National Security and tagged Barack Obama, Mitt Romney, Obama Campaign. Bookmark the permalink.